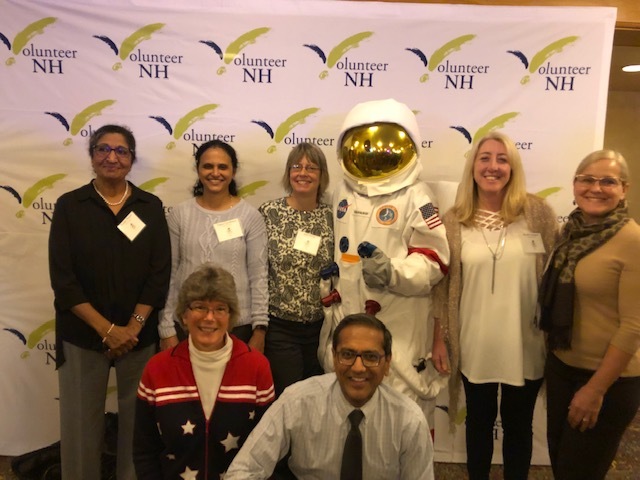 Congratulations to Heather Bogrett, Deb Cicchetti, Gail Duval, Pushpa Mudan, Mary Palm and Vijaya Upadrasta for receiving 2018 Spirit of NH Volunteer Service Awards from Volunteer NH. These dedicated YogaCaps volunteers were recognized this past week at the Capitol Center for the Arts in Concord, NH. A full house cheered and cherished volunteers from across the state in a number of categories. This event celebrates the time-honored tradition of sharing our time and skills to build resilient communities. Pictured in front row are Deb Cicchetti and YogaCaps Board President Jay Gupta. Standing from left is Pushpa Mudan, Vijaya Upadrasta, Gail Duval, Astronaut, Heather Bogrett and Mary Palm. Are you curious about the astronaut (yes astronaut!) who photo-bombed our group? He was representing rear Admiral Alan Shepard, one of the original NASA Mercury Seven. In 1961 he became the first American to travel into space, and in 1971 he walked on the Moon. He was born in NH, as was astronaut and teacher Christa McAuliffe. Their leadership and legacy via the McAuliffe-Shepard Discovery Center in NH inspires every generation to reach for the stars. Perhaps volunteerism is a civic duty, as well as a terrific opportunity for personal development, that enhances the world around us and within us. What do you think?